I grew up in Oakland and Berkeley on the barstools of Triple Rock and Picante next to my dad, who drank a six-pack of Sierra Nevada IPA every day. I swore I wouldn’t drink until one day I, like many of you, had my first slug of Mickey’s in the park next to school. My parents worked with their hands and their heads, and in their own ways, they taught me to push the boundaries of both femininity and the socially accepted places for women in the workplace. My childhood experiences rooted in me values I’ve tried to take with me wherever I go. So, as I got older, I taught myself how to work on cars, and last year, I befriended some technicians who let me work on my rusty multicolored 1962 C10 pickup truck in their shop. One day while working on my truck, one of the administrators overheard me talking about needing a third job, one more to make ends meet beyond my current jobs working at a library and at my godfather’s farm. He offered to interview me for a serving job at the bar he managed, the New Easy in Oakland. I thought it was a good idea; I could work after school at the bar, the farmer’s market weekend mornings and my work study job in between those and school. But it soon became clear that I wasn’t able to balance everything. When it came down to it, I chose working at the bar because I knew I would be taught a skill I could take with me wherever I went, and therefore I would always be able to find work. My first shift was rather memorable. It was one of my two shifts a week with a male bartender, Archie, who quickly became a friend of mine. Throughout the shift I made many mistakes, but it was exciting to be in a new place and to learn so much about the world behind the bar. It triggered my intellectual curiosity, and I began learning how to claim my space and use my skills to teach patrons the different tastes and textures that exist in what they are drinking. The excitement came to a crashing halt, though, when I went to grab a few bottles from the stock room above the bar. Before I passed the ice machine toward the rickety staircase upward, a patron grabbed my arm and cornered me into the wall: “You are so beautiful. I’ve never seen you here before. Let me take you home tonight.” I pushed passed him and said “No thanks,” rushed into the stock room and caught my breath. Toward the end of the night I was cleaning out the popcorn machine and the same man came up to me and asked me “What time do you get off? I’d love to walk you home.” Quickly, Archie said, “No you don’t, leave her alone.” The man replied “Let her answer! ” Archie could tell I was uncomfortable and told him to leave, and later I explained to him what had happened earlier by the stockroom. He told me, “Look, unfortunately that type of stuff is going to happen. But if someone touches you, they leave, OK? You just tell me if something happens and we ‘eightysix’ them.” To “eightysix” someone means to kick them out of the bar and ban them from coming back. “You are so beautiful. I’ve never seen you here before. Let me take you home tonight.” I pushed passed him and said “No thanks,” rushed into the stock room and caught my breath. I’ve heard several of my friends in the bartending network talk about this exact predicament. Perhaps this is because talking to your bartender can be a form of therapy, and women are considered “more easily trusted.” I have found that it is most likely the case that men are regarded as bartenders first and sometimes conversation partners second, whereas women are treated as tools for flirtation first, then as bartenders second. “You’re a hottie, you can get a job anywhere,” a male bartender friend said to me during a recent discussion about me finding a new job, like it was my looks that would determine my eligibility. Perhaps he was noticing the privilege of being “good looking,” stating that it would open up opportunities for me that others wouldn’t receive, but it felt like I was being told that my skill level wasn’t as important as my level of attractiveness. A part of my job is to pay attention to those that I’m serving — but I receive a different type of attention from customers than the one I give. The same man always ordered drinks for everyone and was the only one to talk to me directly. They called him “Alpha,” overtly signaling the dominance he had over the group. If I was working, he tipped. If I wasn’t working, he wouldn’t tip at all, even if it was on a tab totaling more than $100. At one point, when I was looking for work again, the men approached me and asked how much money I made at the bar. I was uncomfortable with their question and they rephrased it, explaining that they were opening their own bar and that they wanted me to be their lead bartender. The patrons couldn’t give me its name, address or any other important information, but they asked me to “name my price” for how much I would leave my job to come work for them. We kicked them out; it felt like they were trying to buy me, like trying to buy a bottle of vodka. These situations occur more often than not, and they usually come from a patron’s feeling of entitlement over the person that is serving them alcohol. Bartending, like in this situation, can be scary sometimes, especially when you have hostile customers or feel threatened. You can’t leave your bar; you’re stuck there if someone is rude to you or if someone disrespects you. There is a mentality and an expectation that if you are a female bartender, you have to be strong and have thick skin, because people treat you without respect more often than with respect. But, at the same time, in order to make money, you also have to be sweet and flirtatious, attractive and smart, attentive and be a good conversationalist, but not too much of any of those things, otherwise your patrons assume you are just trying to be tipped well. Women, especially, are caught between a rock and a hard place in this respect. For example, I’m not going to flirt with someone and pretend like I’m interested in them, get them drunk and make sure they tip me well. It isn’t about straining people of their last dollars and cheating them out of a good time. Rather, we want people to have a good time, enjoy their drinks and the atmosphere of the place they’ve escaped into momentarily. Most of the time, I’ve found that I become a part of the escape for patrons. People respond excitedly when a young woman is behind the bar. Serving someone drinks can quickly turn into tending to a person’s desires. This type of relationship rides the line of a master-servant dynamic, especially when requests go outside of our job description. Sometimes, the way patrons ask me for drinks makes me feel uncomfortable; for example, when someone comments on my body and then asks me for a “favor,” like making them an extra strong drink, and then winks at me, it makes me feel like my body is being used as a vessel to hold their attention, separate from my ability to perform my job. I have been called beautiful or gorgeous more times than I’ve heard “thank you.” Interactions with patrons of all genders tend to go beyond compliments and into a space that requires the careful ability to say “no” when asked on a date, or whether I’d go home with them. We can’t say no without consequence, whether it be through tips or through anger. I’ve only touched on a few parts of being behind the bar, but they have been the most memorable. 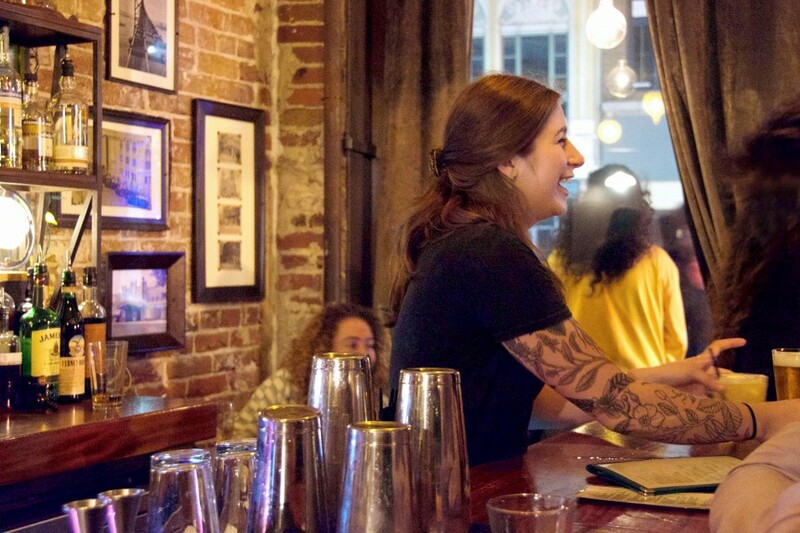 I wrote this piece because I wanted to galvanize conversation about the bar industry that so many UC Berkeley students are entering, and I hoped to bring to the forefront the perspective of a female bartender. Ultimately, my experience bartending has shown me that the industry can be a fantasy space — a place where fear and aggression dance together, and I’m often caught in the middle.